I joined another drawing group (on Meet-up) and they happened to have a session in my town today. It was great to get there in less than 10 minutes. But I was nervous, as well, for several reasons. First, I hadn't met any of these artists. This group tends to meet in people's homes (as today) and that can be more intimate, and (for me) a little more awkward with strangers. And the entire group attending today were women. I've been drawing with a group that has been all male, by coincidence. Today I knew I would be the only male in the room. When I arrived I met the model outside. She was beautifully full figured, carried herself like a dancer (which she is) and was African-American with gorgeous skin tones. I caught myself smiling happily at her poses (including some challenging yoga positions) and the lovely way the natural light from the big windows illuminated her strong curves. We set up in a large narrow livingroom space, which was a little difficult. Since I stood at my easel I moved to the back, and looked over the pads of several ladies who were seated. But I could see most of the poses well enough, it was a good group, pleasant, and I can learn a lot from many of them. 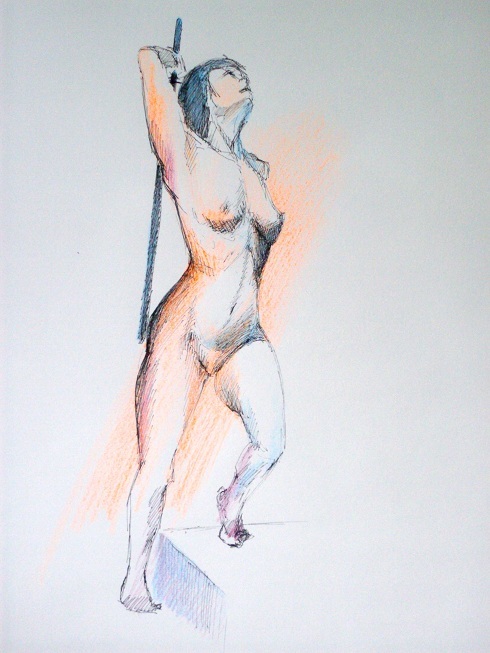 Some have extraordinary ability to capture the pose, and do it expressively. Several create particularly beautiful lines. Unlike the sessions I attend on Thursday evenings, where no one shows their drawings, this group shows their best at the end, while everyone offers encouraging observations, and the organizer of the session photographs them to include several (without attribution) on the group's site. This encourages others to join us... Seeing the drawings (of the same poses you just drew in a quite different way, perhaps) can be amazingly instructive and inspiring. A few of us talked afterward about materials and getting back into this after years (several of them resumed only a few months ago). It was wonderful. I still have so much more I want to do with these drawings, and I can't seem to get to a different place yet. Today, with all the other strangeness, I stuck to my usual ways. But I want to work with pen, brush, and watercolors. Eventually I want to paint figures with acrylics. 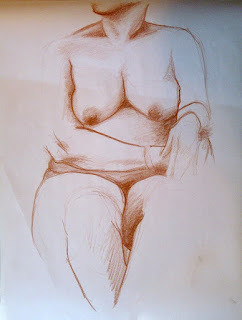 But I need to loosen up more, see the lines I'm ignoring, and get more expressive. The two red/orange drawings are Nupastel on newsprint. 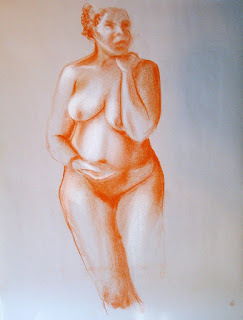 The other was done with a watercolor crayon - also on newsprint. This last drawing was done before the session, to warm up a little before I headed out the door. It was done from the models/poses DVD I got for Christmas. 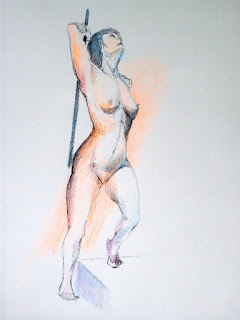 Pen and colored pencil on sketch paper - about 13 inches high, from head to foot. I love the curve that starts in her neck and runs all the way to the inner contour of her right thigh. apologies i have not been by lately, life being a zoo of late. I love the red/ brown drawings. And I agree with Linda about the humanness .. but then, you always had that touch :-) I've never tried a live drawing like that (I think here in the UAE, I probably won't). Maybe somewhere, sometime, in the future. Since I don't draw or paint (much), I see the whole thing. I don't see the parts broken down. I've noticed lately when I'm in Sophie's room picking up random bits of things, she's starting to draw in shapes and lines that form the figures or things. I really want to encourage her to pursue drawing. Ideas? 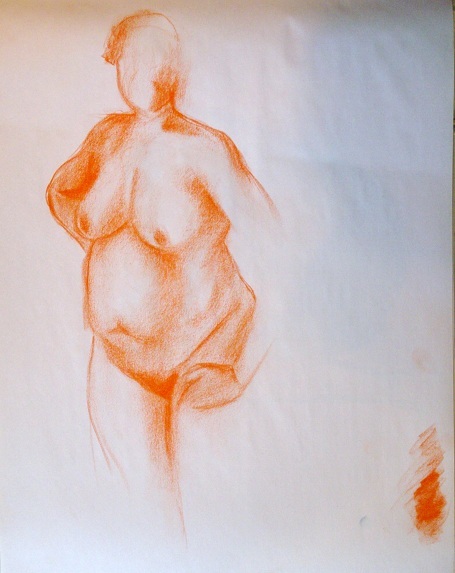 I think it turned out well for you drawing with a group of women. I think you picked up some languid vibes. These are lovely.